The instrument shown below is a 6-string electric violin which was commissioned by a player in Ohio. 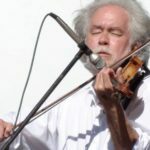 One of the reasons I started my instrument-making business was so that I could make whatever instrument a player envisioned, within patent considerations. The player and I met and talked when he happened to be in Oregon. We discussed the wood that he wanted the instrument made from. Claro Walnut was one possibility, though Maple was also an option. This instrument was completed in 2003. In the late summer of 2002, there was a windstorm in Eugene that took down power lines…and a number of trees. As I was driving home one day, the main street that I usually used on my trip home was blocked by a huge tree which had been cut into large sections for removal. The tree was a Maple that was nearly 3 feet in diameter. I found a kind person to load one of the 300 pound sections of the tree into his pickup and take it to my house. I had the piece of wood milled and then kiln-dried, and used one of the pieces from this tree for the instrument below. After taking measurements and cutting out the body of the instrument, I dyed it a dark brown with analine dye. I used one of Rich Barbera’s “Twin-Hybrid” bridges for the instrument for the finest sound possible. 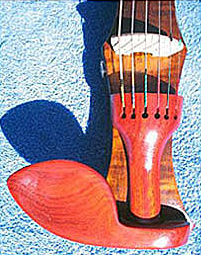 The tailpiece and chin rest, which I made by hand, were made from Bloodwood, at the request of the player. That wood was acquired from Gilmer Wood Supply in Portland, Oregon. As an aside, when Bloodwood is cut using a bandsaw, it has the most unique scent of any wood I’ve ever encountered: a combination of flowers, candy and chocolates and special hors d’oeuvres. The tuning machines in the picture are Steinberger gearless tuners, which have a 40:1 tuning ratio so that no fine tuners are needed. These tuning machines are about 1 ounce a piece, and the player decided, because of weight considerations, to have them replaced with standard guitar tuning machines, though the instrument still performed beautifully. The inputs for the upper bout extension shown in the lower-middle picture were used so that the extension could be removed, if desired. Though the massive tree that blew over in the storm is, for the most part, probably no longer with us in its prior form, I like thinking that at least a part of it lives on, and is producing wonderful music for audiences. The player later recounted to me that when he was in a practice room with the instrument, a woman saw the instrument and said: “That is sexier than a guitar!”, which I will take as a compliment.